Why shop anywhere else? That's what we thought when we checked out www.Rubyskids.com!! No need to leave your house for anything if you need something for your baby or toddler when you can jump on your computer and see the selection at Ruby's Kids! That's right, from their Toy Shoppe to Clothing and Accessories (including shoes, cool jeans by Earnest Sewn Kids and even sleepwear), Bed and Bathtime products and Clothing, Decor, Furniture, Art and Travel, you can shop until you drop and then come back in the morning for more! The toy selection is outrageous...does your little one need a Harley Davidson Motorcycle or PGA Tour Gold Cart Rocker? Or how about a pedal car or an airplane? 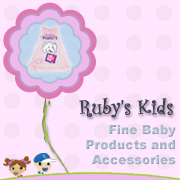 From little duckies to big ticket items, Ruby's Kids is the place to be! They even have animal squirties for the bath! Don't you want to go to just one place to see who all of the hip designers in today's infant and toddler's stylish world are? Come be a part of it at www.rubyskids.com! This Belly Scoop has been sponsored by Ruby's Kids but we love them anyway!